If you are currently looking for the best TV antenna on the market right now, you can put Mohu Leaf Ultimate into your consideration. Mohu Leaf Ultimate is a TV antenna that is extremely flexible and versatile. By saying ‘flexible,’ we do mean that it is literally flexible – it comes with an ultra-thin paper-like body that is highly adjustable and customizable. In addition, it also offers the ultimate performance level by incorporating a technology originally designed for the US military. Let’s get to know Mohu Leaf Ultimate more below! Mohu Leaf Ultimate is loved by many urban families and the modern society because of its extremely simple but functional design. The antenna’s ‘leaf’ is very slim, light, and flexible. Such design allows you to mount it on the wall or even stick it to the ceiling. Or, you can put it behind the painting on the wall – you can put it anywhere, really. You don’t need to worry so much about the signal reception because Mohu Leaf Ultimate is multi directional. It can capture signals and broadcasts from any direction just fine. This is very convenient; there will be no more fumbling with an antenna in order to find the angle with the best signal reception. The sophisticated design is modeled after the mud flap antenna used by the US military. Oh, by the way, the leaf is also paintable, allowing you to suit it to your home’s decor. Mohu Leaf Ultimate is rich in features, another reason behind its fame and popularity. First, it is able to receive both analog and digital TV signals, making it a great choice if you want to get all the channels available. With the 50-mile range, it should be powerful enough for use even at distant places or when camping. Don’t worry; if you need more power, Mohu Leaf Ultimate comes with an antenna amplifier that boasts a patent-pending technology for increasing signal reception range, at the same time filtering RF noise. The amplifier can be powered by the USB port on your TV. This way, it will only consume power whenever the antenna is going to be used, which is when the TV is turned on. However, if your TV doesn’t support USB, you can use the AC power adapter instead. The cables are conveniently included. 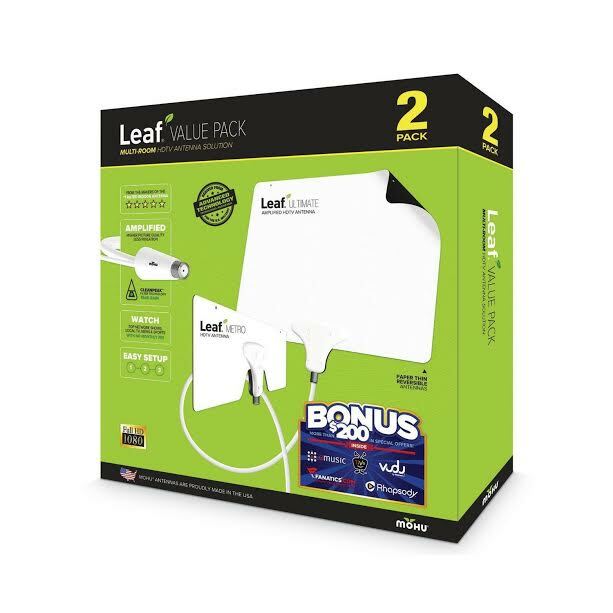 - Bundles includes 50 miles of Mohu® Leaf Ultimate and 25 miles of Mohu® Leaf Metro - Great for urban living, camping, tailgating, dorm rooms 120V wall outlet - 16 FT high performance cable. Up to 50 mile range, Clean Peak Amplifier - Portable HDTV antenna, No batteries required - If you have any difficulties with the installation of your antenna, please contact Mohu for assistance. Putting Mohu Leaf Ultimate into use, the performance proves to be as good, if not better compared to other TV antennas on the market. The filtration feature is obviously working, as the visual reproduction is clear and distortion-free. In general, you will find it having the optimum performance if placed fairly high or near a window, away from the TV and other electronics to avoid interference. The amplifier is performing very well, as Mohu Leaf Ultimate has successfully capable of providing more broadcast channels, while also delivering clearer images on stations with less-than-perfect reception quality. Check the best price of Mohu Leaf Ultimate here!